Sunday Sept 18th is the 31st Annual Terry Fox Run. I have attended runs since 1993, when Terry's younger brother Darrell asked me to be a Terry's Team Member – a cancer survivor who demonstrates that cancer research has made a difference. When I first met Terry's mother, Betty Fox, she said I had a few runs to catch up on…. or maybe she told me that after I told her I was speaking at 3 different run sites in one morning. When I first became a Terry's Team member, I would also drive out to the Terry Fox Run Foundation office in Coquitlam and have lunch with Terry's older brother Fred. Fred had taken over in the BC Run office, as the younger brother Darrell had moved to Toronto to be at the National Run office. That was just after 1994, when Fred had moved the BC office from Downtown Vancouver back to the Fox Family's hometown of Coquitlam. Since that first year in 1993, I have spoken at Terry Fox Runs in Vancouver's Stanley Park, North Vancouver's Seymour River Park, West Vancouver's Ambleside Beach, Burnaby's Central Park, Simon Fraser University in Burnaby, Richmond's Garry Point Park, North Delta, Kelowna BC, and also at a run in Beijing China in October 1993. Here are some media stories that I have found and liked for this year's run. This is a story about Rolly Fox – Terry's father and Betty Fox's husband of 54 years. He’ll be in Port Coquitlam on Sept. 18 for the Hometown Run. Terry Fox worthy of being called a hero GMontreal Gazette – This is a nice story from Montreal as Terry's brother Fred Fox travels across the country doing interviews, that he says his mother would normally be doing. He talks about his brother Terry, and the recent loss of his mother Betty Fox. This entry was posted in Main Page, Terry Fox on September 17, 2011 by Todd. Coupland has written the book “Terry” and is also currently working on the new monument for BC Place Stadium… which was also the site of Betty Fox's last public appearance. the 25th Anniversary of Terry's Marathon of Hope. Hosted by Jody Vance. Featuring Terry's parents, Betty and Rolly Fox. performances by The Paperboys and Silk Road Music. This entry was posted in Main Page, Terry Fox on June 19, 2011 by Todd. Betty Fox – Rest in Peace…. 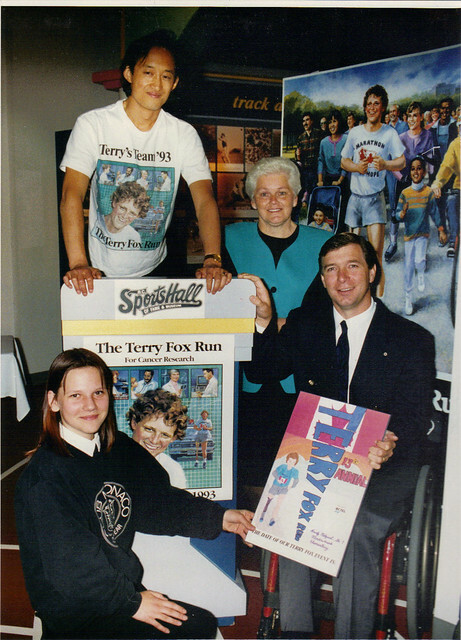 1993 Press conference for Terry Fox Run Foundation with Todd Wong, Betty Fox, Rick Hansen. I have served as a Terry's Team member, living examples that cancer research has helped to make a difference since 1993, when Terry's youngest brother Darrell phoned me up and asked me to consider it. I have spoken and run at Terry Fox Runs throughout Metropolitan Vancouver in Stanley Park, Burnaby, Simon Fraser University, North Vancouver, West Vancouver, Richmond, North Delta, and as far away as Kelowna and Beijing in China. and your family… husband Rolly.. daughter Judith… and especially your sons Darrell and Fred. t-shirt. You are an angel… even though you never admitted or knew it. The last time I talked with Betty was at the 25th Anniversary of the Terry Fox Run in 2005. In this photo, I had just introduced my friend Brenda and her young daughter to Betty Fox. – photo by Deb Martin. I really wanted to attend the Hometown Run in Port Coquitlam. Usually, I would always go wherever the Terry Fox Run Organization BC Division would send me. Sometimes I would speak at 3 events in a single day, such as West Vancouver, Stanley Park, then Burnaby. But in 2005, I declined, stating I really wanted to be at the Port Coquitlam Run. It was incredible! There are so many people. And the run goes past Terry Fox Secondary School where there is a statue of Terry, that you can have your picture taken with. Rafe Mair on CKNW. Darrell phoned me afterwards and invited me down to the Terry Fox Run office. I met Darrell and his older brother Fred, who was taking over the the director position. It was a wonderful pleasure, they seemed to me to be very down to earth people. And for the next few years, I would also go out to Port Coquitlam to have lunch with Fred, and he would give me my new Terry's Team t-shirt. The first time I met Betty Fox was at a press conference in September 1993. I had just agreed to become a Terry's Team member. Darrell was then director for the BC/Yukon Division. The press conference was at the BC Sports Hall of Fame at BC Place Stadium. I was a guest speaker along with Betty, Rick Hansen and Terry's former highschool basketball coach. Here's a link to the CBC TV news story + video story, about how she supported the Terry Fox Run Foundation and what it meant to her. This entry was posted in Main Page, Terry Fox, Todd Wong on June 18, 2011 by Todd. 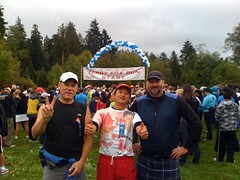 It's the largest Terry Fox Run in the City of Vancouver, and organized by the Four Seasons Hotel management. I hadn't run it in a few years. That year, Darrell Fox (Terry's younger brother) did the 10 km run finishing 1st. One time, I attended with Terry's older brother in 94, and we both said a few words to the crowd. I am a Terry's Team member, a cancer survivor who serves as a living example that cancer research has helped to make a difference. Darrell Fox invited me to be a member of Terry's Team in 1993. 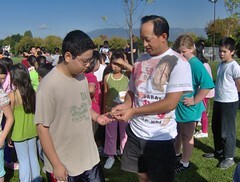 That year I spoke and ran at Terry Fox Run in Burnaby in September, and also in Beijing in October. Prior to the start, I was chatting with my friend Bruce Clark who ran in his kilt. We met a runner from Ontario who was working in Vancouver temporarily. He was excited about running in Vancouver. I shared with him, that I try to run at a different run site each year. Last year I was at Richmond BC. I am wearing the 2005 25th Anniversary Terry Fox Run shirt – it's one of my favorites with the map of Eastern Canada across the front and back of the shirt, detailing Terry's Run from Newfoundland to Thunder Bay. It was in June 1989, that I faced a serious cancer tumor behind my breast bone. The doctors called it a germ cell tumor and it was as big as a large grapefruit. It was displacing my vital organs – pushing on my lungs and heart. I was very weak. After weeks of misdiagnosis I was admitted to Lions Gate Hospital for emergency chemotherapy, where they gave me a 60% chance to live with treatment. Without treatment I would die. I think I was in the hospital for a month, before they let me go home on weekends. The doctors later told me that if I hadn't had treatment, I would have suffocated, because the tumor had put so much pressure on my lungs that they were already half full of fluid. I have attended Terry Fox Runs every year since 1993, at different run sites throughout Vancouver's Lower Mainland including: North Vancouver, West Vancouver, Burnaby, Richmond, North Delta and Coquitlam. Each year, I also speak at Elementary Schools. Sometimes I speak to classes and usually it is to a school assembly in a gymnasium. I share with the children that cancer research does help to save lives. I tell them stories about the people I have met, such as Terry's family, his basketball coach, his wheelchair volleyball coach, his university friends and fellow students. After Bruce and I finished the 3km run (we didn't do the 10km run), we had some water and juice. Then we cheered on runners crossing the finish line. 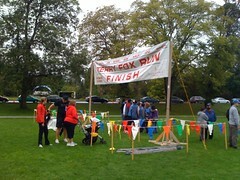 It was a lot of fun, as many of the runners and walkers were smiling. Some were pushing baby strollers. Some were walking dogs. Some said it was their first time participating. Some gave us high-5's. It was great to create some excitement and smiles by thanking them for participating, and clapping our hands for them. This entry was posted in Main Page, Terry Fox on September 20, 2010 by Todd. Terry Fleming at the 25th Anniversary Hometown Run. Lower Mainland + Beijing + Kelowna. Terry Fox Run this Sunday, with me or in your community. some sites are suitable for rollerblades, bicycles and strollers. I will be at 9am West Vancouver or 10am Vancouver…. This entry was posted in Main Page, Terry Fox on September 17, 2010 by Todd. Terry Fox Run in Richmond BC – Great weather and community fun! Richmond run site at Garry Point Park on September 13th, Sunday. 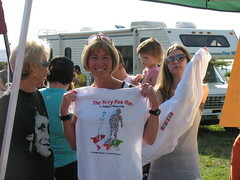 Volunteer Lindsay Pagnucco holds up one of the many Terry Fox Run t-shirts on sale near the registration tent. Richmond Mayor Malcolm Brodie walks with the crowd to the start line. McNulty, Miss BC Sandra Gin, Noel Chalmers (bagpiper). 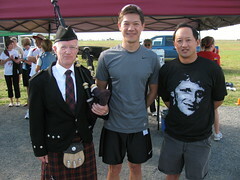 This entry was posted in Bagpipes, Main Page, Terry Fox, Todd Wong, Vancouver Area Adventures on September 14, 2009 by Todd. Terry Fox Run on Sunday, September 13th. Every year I speak at a Terry Fox Run site, and elementary schools. 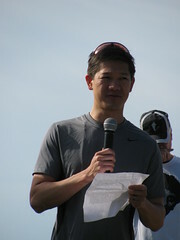 This year I am speaking at the Richmond BC run site. There will be some welcome messages, speeches by dignitaries, bagpiper Noel Chalmers and Taiko drummers! There is no pre-registration for this fun event, simply make an on site donation for you and your family. There will be Terry Fox T-shirts for sale, stickers, ribbons, certificates and tattoos for the kids. You can walk or run a 10 Km, 5 Km or 1 Km route or you can simply stay at the park and enjoy the snacks, music and fun. There will be a timing clock at the finish line for your personal challenge. The Richmond Sea Cadet Band, McNair Cheerleaders, Tara Taiko Drummers and Noel Chalmers and his bagpipes will be there to entertain you. This year our guest speaker, Dr. Andrew Weng, is a senior scientist from The Terry Fox Lab in Vancouver. Parking is free and plentiful. 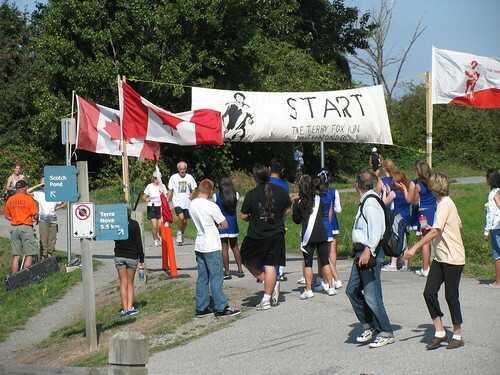 Please join us at Garry Point Park on Sunday, September 13, 10 AM for the Terry Fox Run. It was in 1993, when Darrell Fox, Terry's younger brother, asked me to become a Terry's Team member. He had heard me speaking about Terry on the radio, when I was interviewed after receiving the SFU Terry Fox Gold Medal. Since that time, I have spoken at and participated in Terry Fox Runs at Vancouver Stanley Park, Burnaby Central Park, West Vancouver, North Vancouver, North Delta, Richmond, and even in Kelowna BC and in Beijing China! I have helped to organize Terry Fox events at Simon Fraser University, when we started the inaugural SFU Terry Fox Day and a Terry Fox Run. Incredibly, a Terry Fox Run had never happened at SFU before. Terry's Family attended the ceremonies and a trophy case featuring Terry's SFU tshirt were unveiled. Here's a newspaper article featuring Noel Chalmers and his wife Kathleen. This entry was posted in Main Page, Terry Fox on September 13, 2009 by Todd. Stories of Terry Fox and personal stories of cancer are shared by the Terry Fox Run site in Richmond BC. 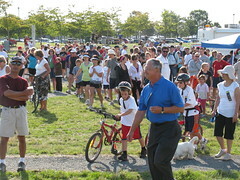 The Terry Fox Run site in Richmond BC, is organized by John & Joan Young, In this 2006 picture, Todd Wong(red cap) stands between Joan & John in middle. Their son 3rd from right. Deb Martin is far right. The Terry Fox Run is the world's largest single day fundraiser for cancer research. All throughout, Metro Vancouver. 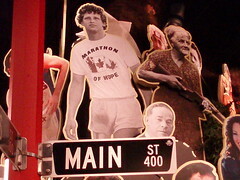 all of BC, and all across Canada, Terry Fox Runs took place communities large and small. And also around the world. The Richmond BC run site is one of my favorites. It is organized by my friends John and Joan Young. 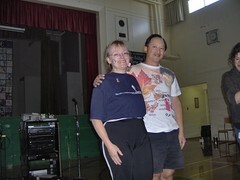 Since 1993, I have been a Terry's team cancer survivor guest speaker in Burnaby, Vancouver, West Vancouver, North Vancouver, North Delta, Richmond, Kelowna, Beijing, and many elementary schools. Meeting different people, who all have a connection to Terry Fox or a cancer story, is one of the best things I enjoy at a Terry Fox Run. This year at the Richmond run, I met somebody who personally knew Terry, a woman whose sister is dying from cancer, and a young boy who heard me speak on Friday at Chief Maquinna School in Vancouver. This year, the guest speaker at the Richmond run was Glyn Davies, a Richmond school teacher, who personally knew Terry as a teenager. Glyn shared his personal story of shooting baskets with Terry at Simon Fraser University, working out in the weight room, and running together. Glyn's father is Lorne Davies, who was athletic director during Terry's time at SFU, who also became a personal friend of Terry and his family. Glenn emphasized Terry's character of always trying to do his best, as well as his dedication to task. During the opening ceremonies, John Young also introduced the mayor of Richmond, Malcolm Brodie, and acknowledge the many volunteers such as the cheerleaders, and bagpiper Noel Chalmers. John acknowledged some of the special donors who had collected $500+ and $600+ such as Olea who was also responsible for putting up all the Terry Fox Run posters around the village of Steveston. After the start of the run, all the runners took off, led by children on their bicycles. I walked over to say hello to Glyn Davies, whom I had first met two years ago, when I had been guest speaker for the Richmond Run, and he had been one of the organizers. Glyn soon introduced me to his daughter Crystal who has followed his footsteps by becoming a school teacher. He proudly stated it is Crystal's first year as a kindergarten teacher. I shared with her that I had helped her grandfather Lorne Davies start up SFU's first Terry Fox Day in 1994, when we also created a Terry Fox trophy case. I also asked Glyn after his father and said that I had last seen Lorne Davies at the coin unveiling for the Terry Fox Coin at Simon Fraser University, and had congratulated Lorne for having recently received the Order of BC. I told Crystal that on Friday, I had spoken at Chief Maquinna elementary school's Terry Fox Run, and I explained that many Terry's Team members will speak at Terry Fox Runs, and sometimes at Elementary schools, serving as living examples that cancer research has helped make a difference. “Let me show you something special, ” I said to her and asked her to open her hand, into which I placed my SFU Terry Fox Gold Medal. “Simon Fraser University created this Terry Fox Gold Medal to honour Terry. He was the first recipient on June 6th, 1981. Twenty-two days later, Terry died on June 28th. I have been a Terry's Team member since 1993, when Terry's younger brother Darrell phoned me up after hearing me speak on the radio. At the time I was being interviewed by Rafe Mair, for just having been awarded the Simon Fraser University Terry Fox Gold Medal. “Darrell turn on the radio, somebody's talking about Terry!” Darrell's wife phoned him at work. He was then director of the BC/Yukon Terry Fox regional office. That evening, Darrell phoned me at home, and we talked about Terry Fox, the SFU Terry Fox medal. Darrell also invited me down to the office to meet him, and we hit it off, also beginning a friendship with his eldest brother Fred Fox. Continuing my way on the Richmond run, everybody ran or walked along the West Dike. I met a woman who was walking, and we started chatting. She said her sister is now on her last legs, after having been diagnosed with cancer. We talked about how cancer also affects not only the victim, but also the family and friends around them. It's important that the person with cancer, also have a good social support team. I shared with her some of the things that my family went through, when I had my cancer. After finishing the run course, (okay I only went up to the 2km mark then turned around), I chatted with Richmond Councillor Sue Halsey-Brandt. We had met 2 years previously at the 2006 run. We talked about running, and also about the Vancouver civic strike and how Richmond was able to resolve the contract negotiations by not using the GVRD Labour Relations Board for negotiations. She said made much more sense to negotiate directly with the Library, instead going through a third party. Terry Fox featured on brand new $1 Canadian coin: unveiled at SFU. This entry was posted in Main Page, Terry Fox on September 15, 2008 by Todd. 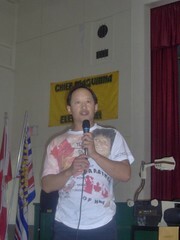 Todd Wong speaks at the Chief Maquinna Elementary School Terry Fox Run. Every year I speak at elementary schools as a Terry's Team member cancer survivor. This year I was invited to speak at Chief Maquinna Elementary by my friend, teacher Bill Hood. It was a very inspiring day. Ms. Wort is a teacher and a cancer survivor. 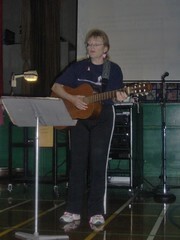 She led a group singing of a song about Terry Fox, written by a former principal. Anna Maria Nicolli-Mullet, principal of Chief Maquinna School introduced me. I told the students about some of my experiences being a Terry's Team member, and some of the stories I have learned about Terry through his family, friends, and coaches. I emphasized that before Terry attempted his run across Canada, he did his training firs – his homework so to speak. I shared that after Terry first lost his leg to cancer he inspired other students, as he continued to shoot basketball and do his training by running on one leg, up to Simon Fraser University. Then I told them about my own cancer story, that I was diagnosed with cancer while I was a student at Simon Fraser University. It was a very life-threatening tumor behind my breast bone. I was hospitalized and spent 5 months on chemotherapy treatment. And now, I have followed Terry's words, that “only takes one person to make a difference” in my efforts to do community service. Ms. Wort and Todd Wong are thanked by Principal Anna Maria Nicolli-Mullet for sharing their stories of cancer survival – photo Alan Zisman. Some grade 7 students went up on stage, and led a warm-up for all the students. Following the warm-up, the students left the gym. The primary kids (about 60 or so) do a run on the sidewalk around the school. The intermediate kids run on the sidewalk around the perimeter of Clinton Park, at Slocan and 1st. They usually do a few laps. There are many run sites in the Metro Vancouver area. This entry was posted in Main Page, Terry Fox on September 13, 2008 by Todd. Terry Fox is one of our greatest Canadians. He is one of our greatest British Columbians. This year he is featured in “The Party” display for the “Free Spirit” exhibition at the Royal BC Museum. Terry's brother, Darrell Fox, asked me to become a “Terry Team member“- cancer survivors who serve as living examples that cancer research has helped to make a difference. Since 1993, I have spoken at Elementary Schools, and Terry Fox community runs throughout Metro Vancouver, as well as in Kelowna (2001, 2002) and Beijing China (1993). It is a tremendous honour to share with both children and adults, how Terry Fox's “Marathon of Hope” has changed the lives of cancer victims, helping to turn them into cancer survivors. I am certain that advances in cancer research helped to save my life from a near fatal cancer tumor in 1989. Elementary) in conjunction with the upcoming Terry Fox Run. We are having our Terry Fox assembly on Friday Sept. 12, at around 8:50 AM. Any chance we could work something out? 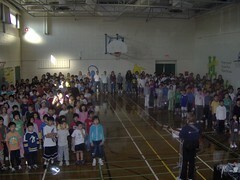 We have about 250 kids in the school (Grades K-7) and are located near 1st and Nanaimo in the East End.. I was especially thrilled to accept this speaking engagement because I grew up about 6 blocks away from Chief Maquinna Elementary School. It's very close to the old neighborhood I grew up in. Usually when I go to an elementary school, I will talk about surviving cancer, using my personal experience as an example. I talk about Terry Fox at Simon Fraser University, and include some of the stories that his former SFU friends, teachers, coaches and team mates have shared with me. Sometimes I talk about running a Terry Fox Run in Beijing in 1993, or meeting Terry's mom, dad, brothers and sister. And in my life, I have been personally very interested in attending Terry Fox events, such as the unveiling of the Terry Fox $1 coin, visiting the Terry Fox statues in Victoria or Simon Fraser University. Or even watching Terry Fox television specials or movies on television. This entry was posted in Main Page, Terry Fox on September 3, 2008 by Todd.